Passengers and rail travel advocates around the country are eagerly awaiting details about new Amtrak CEO Richard Anderson’s plans for our national rail service. Reports from a recent town hall meeting for Amtrak employees offer some clues about Anderson’s priorities for new train equipment. Although this is not yet official, the information indicates that Amtrak is looking at modern, lightweight, unified trainsets. Anderson reportedly pointed to trainsets like the Sonoma-Marin area's Nippon-Sharyo diesel multiple-units (DMUs, pictured here) and the new TexRail Stadler DMUs as the future of train travel. The new Brightline service in Florida is proving that modern equipment is important to bringing in new riders—and keeping them coming back. It’s good to see Amtrak looking in the same direction. Modern train designs are lighter, so they accelerate and stop faster while using less fuel and creating less pollution. They operate as unified sets, which makes them stronger and safer. They’re also more comfortable, because they ride more smoothly and don’t have open vestibules between cars. 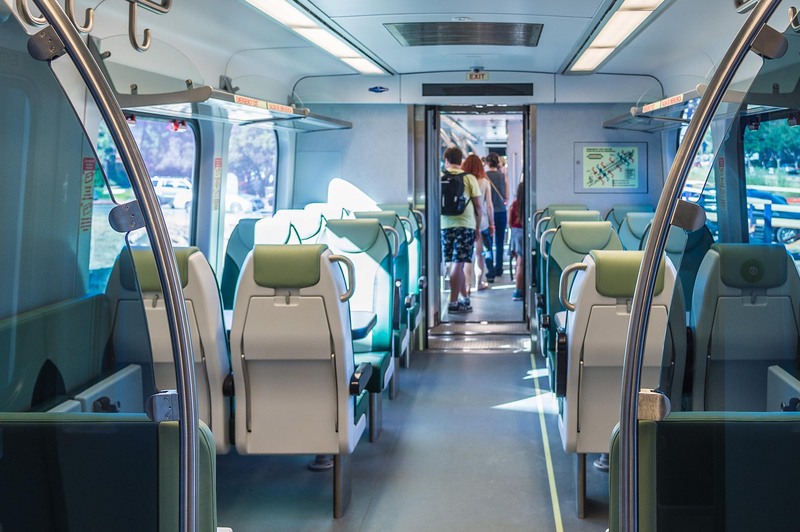 The interiors are bright and open with comfortable seats and wide aisles, and are easily accessible to those in wheelchairs or with limited mobility. It’s easy to bring onboard and stow luggage and bikes. Whether powered by locomotives or distributed multiple-unit power throughout, driving cabs at both ends eliminate time-consuming turn-around procedures at the end of a route. Lower floors and automatic stairs mean all doors can open at stations, speeding up boarding. It would all add up to a better experience for passengers and a more economical operation for Amtrak. Lightweight, modern trainsets are exactly what we need to see more frequent and reliable service on existing routes around the Midwest. We also need them to begin serving new routes, like Chicago to Rockford. Design aside, it’s refreshing to see Amtrak talk about getting new equipment, period. Amtrak is constrained by its current fleet, and can’t add or improve service without replacing and expanding the fleet. Anderson is said to have mentioned a desire to see a completed RFP and contracts awarded this year, which means we could see these new trains within several years.